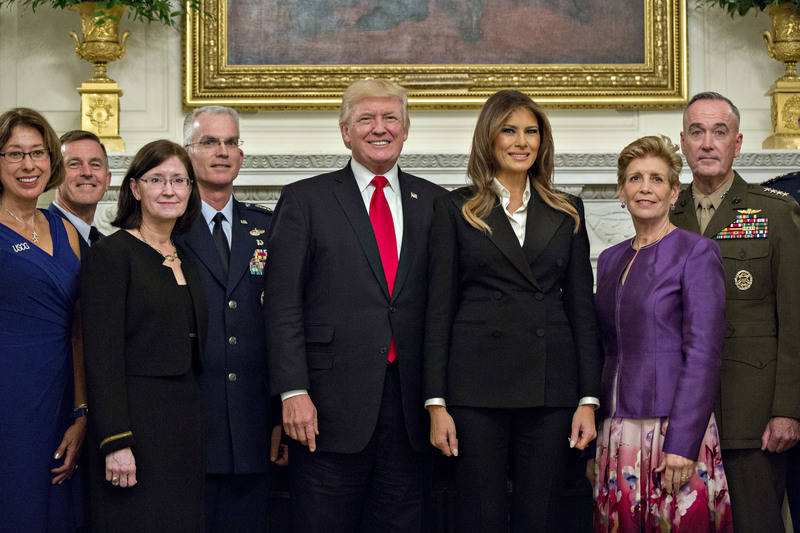 President Donald Trump summoned the White House press corps Thursday night to photograph his top military aides and their wives. During the shoot, Trump told reporters the evening represented “the calm before the storm” but would not elaborate. White House reporters were called to the State Dining Room and asked to document a formal dinner Trump spontaneously decided to host for his military advisers. Trump referred to the impromptu dinner and photo shoot as “the calm before the storm,” before praising the military and reiterating his array of military options with respect to North Korea. One reporter replied asking Trump to explain what he specifically he was referring to, offering the Islamic State, North Korea and Iran as potential answers. The group reportedly discussed escalating tensions with North Korea and the expected decision on whether to remain in the Iran nuclear deal. Trump issued another stark warning to North Korean dictator Kim Jong Un, reiterating that he has a range of military options at his disposal.